As WordPress started becoming popular, people set to think that there are two WordPress websites – wordpress.com and wordpress.org and both include the subject WordPress and information. But there are major differences between both of them and not the only ones you think. 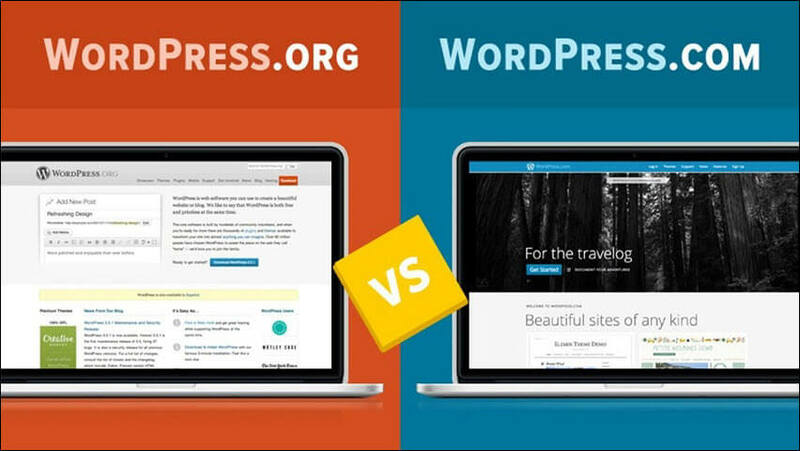 So before getting into the detailed information lets understand some basic difference between WordPress.com and WordPress.org. It’s a free online platform that allows you to create your own blog or a website based on some default themes including plugins and much more in one place. To make it simple, we can refer an example of Google docs. It is as similar to Google docs wherein you can upload your own creation based on default templates. Even you don’t have to buy any hosting account or any domain name as you are using WordPress.com. You just need to sign up and create your own account. It is unlike WordPress.com. It is an open source software that can be uploaded to your own web hosting server. Before launching a website you need to download it and install it on your web server that you have purchased from the third party. Again to make this simple as WordPress.com we can refer an example of Microsoft word or Open office. This will require you to buy your own domain name and hosting account as stated above from the third party. WordPress.org has thousand of free plugins and designs to be installed according to your website’s requirement. Space Limit It allows you free hosting but limits your web space to 3GB WordPress.org is not a free platform. It doesn’t come with free hosting. You have to get it hosted by paying individually so no issue arises with space limitations. Custom Domain It comes with a subdomain like “yourbrandname.wordpresss.com”. To get a custom domain you need to pay separately. If you are looking for shopping or branding website you should surely upgrade your plan to paid version wherein you can easily get your brand name as your own domain name. It allows you to get a custom domain you just need to choose your desired name if it is available. Security Though it’s a free source still you get some basic security and backups for your website/blog. You need to be cautious while using it. No matter your website is hosted or rented from a third party server you get a level of security but need to be careful and secure your website’s data. To make this easier WordPress has ample of third party plugins. Control You don’t have full control on the technical performance of the website. It is your website and you own it but when something goes wrong you need to ask WP team to fix it and wait for the solution. These fixes are handled by WP technical team. You have full control on your website. You don’t have to wait for the assistance of WP team. It has got more plugins than WordPress.com and performance settings. It sets quickly once you become an expert. Theme As stated above that there are certain limitations to this free source. Another limitation is the theme. There are limited number of themes and that too partial for customization. It allows you to install any color, pattern theme you want. From a large variety of theme categories, you can customize them as well. If you are a PHP expert you can modify or create your own design with creative colors. Features It doesn’t allow you to set any extra feature or premium plugin. It comes with narrow pre-installed features. It lets you install the premium plugin or extra feature that sets your website’s theme or other customization. Earnings It displays and runs their own advertisement. You cannot post your own ads. This way you can lose some extra earnings that you can have through these ad campaigns. You can display your own advertisement and earn extra income through these ad campaigns. Wordpress.com is free and cheaper than the other source but useful for beginners or bloggers. If you owe a personal blog related to nature, traveling or any category other than the business you should use the free version. On the other hand, WordPress.org is meant for business and professionals. If your intent is to generate revenue through online business then nothing could beat WordPress.org. It is a clear and commercial platform with a varied theme, plugins, and features that make it easy to use for professionals. However, the above differences and the conclusion clearly states that both of them hold diverse value unless it comes to commercial usage.